Wearing colored pants is so much fun. They become the focal point of the look, but like with this look, there is still room to wear a fashionable top and other accessories such as these heels! I got these yellow pants from H&M. They have this straight vinyl look and shows now buttons, zippers, rivets, etc. that make it really sleek and even perfect for professional wear. The white polka dot shirt is from Zara, and is such a fun universal piece to have in the closet because it can really go with anything. Wear it with cute shorts, with a pencil skirt, with skinny jeans or bell bottoms, with bright and dark colors, with denim- it goes with everything. 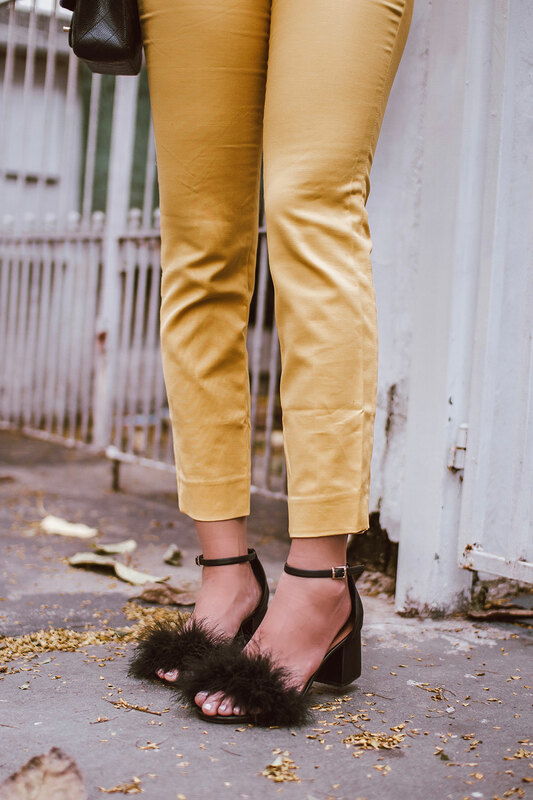 But can we take a moment to appreciate these black feathered heels? The added texture is this extra pop to the outfit without taking away from the Yellow pants or polka dot shirt. Ladies, don’t be afraid of heels like this! I’m wearing my black Chanel purse, which is mildly bling-y with the chained accents and emblem. Next PostNext Designer Bags & Dupes for Cheap!